I am going to show you how to case a card today. Have you ever seen a card that you like and wonder how to make it? CASE is the crafting word for Copy and Share Everything. The most important point is to give credit to the person that designed the card originally! 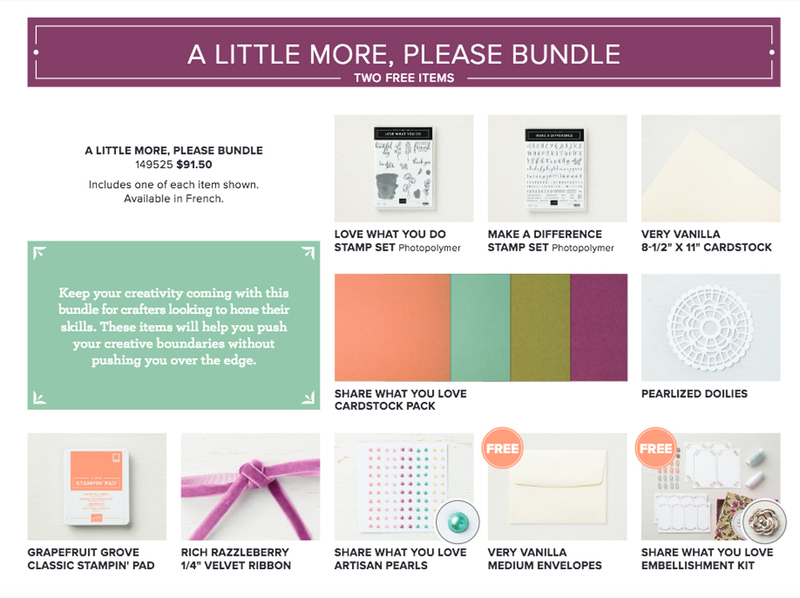 This week I have been playing around with the Share What you Love Bundle of products since those are featured this month. I like the card that is in one of the examples that Stampin’ Up! published to the Demonstrators. So I am going to show you how I CASEd the card and then made a version that is just a little stepped up (more bling added). The Card on the left is the card that Stampin’ Up! published on the demonstrator site. This card has a Rich Razzleberry Card base that has been cut to 4 1/4″ x 11 and scored at 5 1/2″ to stand the long way. A piece of Whisper white cardstock has been cut to 3 3/4″ x 5″. I can tell the dimension by the wider layer that is on this card. Most card layers are 1/4″ smaller – this has a wider layer (more of the background card is showing) so the layer is 1/2″ smaller than the card base. To make the banner end on this layer, I made a little mark on the bottom of the layer in the center. Then went up 3/4″ and made another mark. I used my Paper snips to cut on the diagonal from each edge to the dot int the center. The Center of the card is stamped with the Love What you Do Stamp set. The background and small flowers on the top are stamped with the new In-color Grapefruit Grove. I have to say this is favorite new In-Color for this year. The leaves on the side are stamped with Old Olive ink. The rose is stamped with Rich Razzleberry ink. The cute detailed tag comes from the Share What you Love Embellishment Kit. 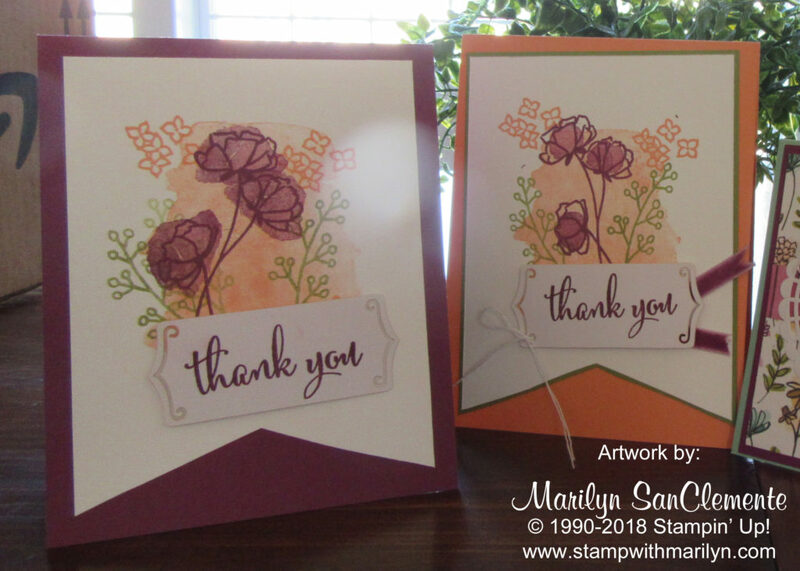 “Thank you” is stamped with Rich Razzleberry ink. Here are the items from the Stampin’ Up! Bundle. Interested in getting a head start with this new Suite of Products? Check out the bundles HERE. As you can see to the left, the bundle includes the Grapefruit Grove Ink pad!! The card on the right is a stepped up card with an additional layer and a little more bling. The Card Base is the new Grapefruit Grove Cardstock. The whisper white layer is the same size (3 3/4″ x 5″) with a layer of old olive underneath. The old Olive is cut to 3 7/8″ x 5 1/8″ to make a very narrow layer. The background is stamped with the Grapefruit Grove ink. Leaves are stamped with Old Olive Ink and the roses are stamped with Rich Razzleberry ink. I added the tag from the Share What you Love Embellishment Kit and tied a piece of the white twine in the kit thru the side of the tag. I then added two small piece of the Rich Razzleberry Velvet ribbon as a tail coming off the side of the tag. That’s it! That is how to CASE a Card. You make the card as shown or you can modify the card and add your own touches and embellishments to it. As we all know, the embellishments are the fun part! If you do not have a demonstrator in the USA – I would love to be your demonstrator. If you order is under $150 then use the Host code RY33UA2V and I will send you a special gift for placing your order with me. I love to share the Host benefits with my customers! Share what you Love. Bookmark.